The Massachusetts Institute of Technology (MIT) has been named the world’s top university for the fifth year in a row by the latest QS World University Rankings . Based in Boston, MIT scored full marks in this year’s ranking. Strong academic and employer reputations were underpinned by academic excellence. Quacquarelli Symonds ranks universities based on six indicators: academic reputation; employer reputation; student-to-faculty ratio; citations per faculty; international faculty ratio and international student ratio. For the first time in over 10 years, US institutions take the top three places. Stanford and Harvard swap places from 3= and 2nd respectively. Stanford’s second place highlights a steady rise up the rankings. Fifteenth in 2012, this year the California-based university scored 98.7 out of 100 to pip Harvard. Cambridge, joint third with Stanford last year, drops down to fourth. QS highlights a broader trend of Western European institutions falling down the rankings. “Some Western European nations making or proposing cuts to public research spending are losing ground to their US and Asian counterparts,” said Ben Sowter, head of research at QS, in a press release . 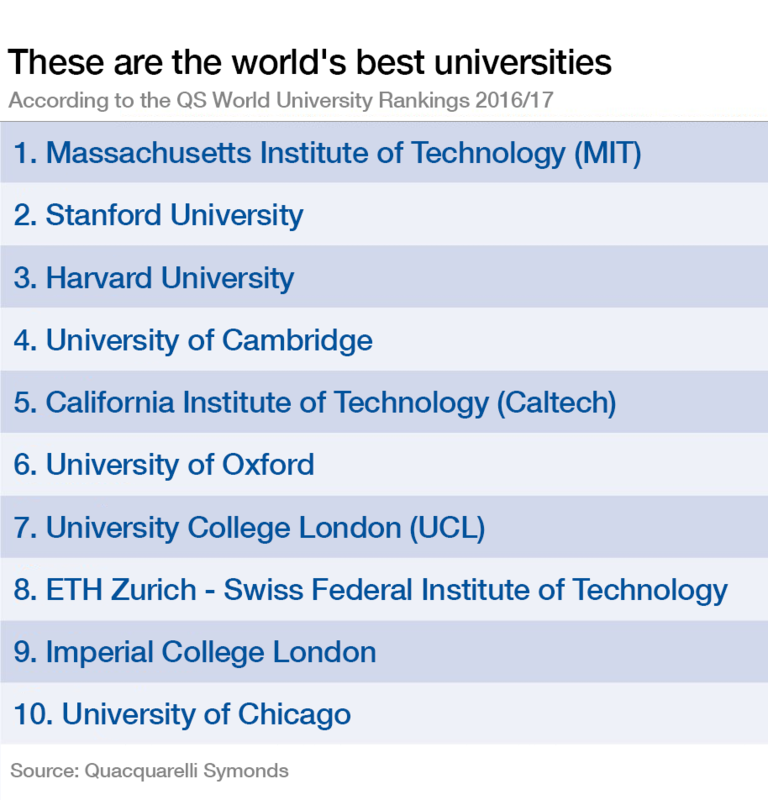 Just one non-US or UK institution makes it into the top 10 – ETH Zurich in 8th. Asia’s highest ranked institution remains the National University of Singapore, in 12th, followed by the Nanyang Technological University, Singapore in 13th. QS also highlights the continued progression of Chinese institutions – Tsinghua University has risen to its highest-ever position of 24th. Australia and Canada also increased their representation in the top 100, while a Latin American university features for the first time. Universidad de Buenos Aires takes 85th place. Investment in further education is the key driving force behind risers and fallers, say QS. As the World Economic Forum’s Skills for your Future series highlights, the world of work is changing rapidly. The skills required in the future are evolving and changing rapidly from those of today. Investment in higher education will play an important role in making sure the future workforce has the skills employers will be looking for. Have you read? Want a job in 2025? These are the sectors to focus on Are you ready for the jobs revolution? How do you get a job that doesn't exist yet?